Acupuncture means the practice of Oriental Medicine based on traditional Oriental medical theories, including, but not limited to the stimulation of a certain point or points on or near the surface of the body by the insertion of needles to prevent or modify the perception of pain or to normalize physiological functions, including pain control, for the treatment of diseases or dysfunctions of the body and includes the techniques of electro-acupuncture mechanical stimulation, adjunctive therapies and moxibustion (45:2C-2, NJ Acupuncture Board Laws). Acupuncture works by inserting thin, sterilized, surgical stainless needles into specific points in the body. In some cases, Acupuncture needles are inserted and left undisturbed for a set period of time (in a treatment session), then painlessly removed. In other instances, following the needle insertion, the needles are strategically manipulated using an array of rotational or angular maneuvering techniques under the highly trained Acupuncturist. The strategy and technique of needle stimulation is based on a patient’s clinical presentation which modulates the correct needle prescribed “dosage,” including length of time of insertion. Even when the focus is on treating a specific symptom or presentation, the goal is to balance, unobstruct, or clear the body’s energetic pathways called meridians. Without a clear unobstructed energetic (Qi) meridian flow, reaching homeostasis (energetic and physical balance balance and wellness) will be hindered. Acupuncture can manage pain, improve local circulation, clear pathogens, and optimize organ function, making it a versatile style of medicine. Huge!! Just kidding. A picture is worth a thousand words (See the image to the right). So, an Acupuncture needle is solid (not hollow) and the gauge (width) varies, because an Acupuncturist will carry several sizes. But, the average gauge width is 0.25mm as compared to a medical syringe gauge width of about 28.5mm. Basically an Acupuncture needle (as shown on the picture) is about 1 quarter the size of a sewing needle, and is flexible. Yes. Needles are sterilized as they are individually packaged, inside a sterilized guiding tube. Strict Acupuncture clean needle guidelines must be adhered to by a Licensed Acupuncturist according to training and certifications, and also because it is the law. New Jersey state Law requires all Acupuncturists to be Clean Needle Technique (CNT) certified prior to applying for state Licensure. It is also the law for an Acupuncturist practitioner to only use single-use disposable needles. Acupuncture is not for everyone, not because of safety concerns or issues, but due to social norms, belief systems, fears, misunderstandings, or just because. If you have any questions or concerns if Acupuncture may be right for you, please consult with your Primary Care Physician. You can contact us anytime for further information on our medical profession and experiences with Acupuncture. What is Kiiko style Japanese Acupuncture? I (Marcus Rosario, L.Ac., LMBT) trained in four modalities of Acupuncture: Kiiko Style Japanese Acupuncture, Traditional Chinese Medicine (TCM), Five Element Acupuncture, and Classical Acupuncture. At times, I may integrate these modalities based on patient presentations, but my specialty is on Kiiko style Japanese Acupuncture. This modality emphasizes palpation of the body for diagnostic input. It is a very hands-on approach to palpate a patient’s meridian channel, acupoint, or abdomen (called Hara), allowing for differential diagnosis for the benefit of the patient. My treatment protocol focuses on which modality will be the best treatment protocol and delivery for the best interest of the patient. Fortunately, since acupuncture is still gaining popularity here in the United States, it is in our experiences that patients (more often than not) search for an Acupuncturist when all else fails (according to their testimony). This allows for us to specialize in very difficult, chronic symptoms and imbalances, including pain management. Oftentimes, it is in the best interest for chronic patients to use Acupuncture to integrate to their current protocol of treatment, as prescribed by their primary health care physician. Integration of Eastern and Western therapies can offer a very potent approach to a patient’s medical needs and attention. Do you specialize in other treatments? Yes, I (Marcus Rosario, L.Ac., LMBT) am trained in Tui-Na (pronounced Twee Na), an Asian Bodywork Therapy often used in China in conjunction with Acupuncture treatments. Tui-Na therapy can be performed before, during, or after an Acupuncture treatment, or as a treatment by itself, depending on the patient’s presentation. Pain or discomfort (or imbalances) is usually what gets someone to try Acupuncture treatment, in the first place. The needles are very thin, and although there are an array of needling techniques used to achieve and intended result by the Acupuncturist, if the patient is concerned or afraid, it is perfectly normal (and expected for a first-time patient). So, please relay to us all your worries or concerns; it is our goal and obligation to make the patient feel comfort during and after treatment (especially with results of feeling better than they felt before the treatment). This is our goal with every patient. Having said that (the good news!! 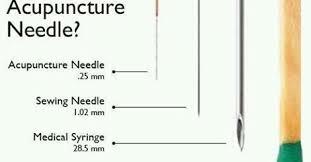 ), is that Acupuncture needles are not comparable to that of a patient’s experiences to injections or blood draws. The Acupuncture needles are much milder, and they are solid, not hollow. Hollow needles are one of the reasons why they may hurt, including the gauge (width), which is a lot wider than an Acupuncture needle. What am I supposed to feel during an Acupuncture treatment? Sensations from an Acupuncture needle can vary; from feeling nothing at all, to a mosquito bite sensation, or a heavy sensation (or moving sensation). There are times, if the needles are inserted near a nerve, the sensation can be sharp and quick, and with a quick adjustment, the sensation disappears. Finally, our specific training with martial arts Qigong (exercises) and special sensitivity training combined with needling techniques allow us to have the highest level of control with what needling sensations we want the patient to feel. Needling technique and procedures are based on the patient’s diagnoses, and the desired results of the Acupuncturist. During your first treatment, you will be asked many questions, some related specifically to your complaint and others seemingly unrelated. With all aspects of Oriental Medicine, your entire case is taken into consideration so we can determine what is causing the disease. We treat the whole person, not just the symptom. After that, the practitioner will look at your tongue and feel your pulse- two key assessment methods of Oriental Medicine. After the initial evaluation, you will receive your prescribed Acupuncture treatment. Your first visit can take up to 90 minutes, and follow-up Acupuncture treatments can last from 20 minutes to 60 minutes, depending on the practitioner’s recommendations and chronicity of your condition. Acupuncture is most effective with a series of treatments. Some patients see changes within 1 or 2 treatments, especially during the acute stages. More chronic illnesses you can usually gauge improvement within 3-5 treatment sessions, after which it is usually fine to space out the frequency of maintenance treatments (if needed). Chronic or complex cases usually involve an extended or long-term treatment plan. Many patients choose to receive Acupuncture treatments on some kind of continuing basis (whether weekly, bi-weekly, monthly, or seasonally) for health maintenance, preventative care, stress reduction, and relaxation. Will insurance cover the cost of my treatment? Yes, depending on your provider and plan, and your diagnosis. Please call us with your insurance card before making your initial appointment, so that we can verify if your insurance is covered. Our office does not participate with any insurance company although we will submit claims for you, so that you do not have any paperwork to complete. Remember, that insurance coverage is a contract between you and your insurance company, not with any Health Care Provider. You are responsible for understanding your health plan benefits and for obtaining any pre-certification or referrals necessary to guarantee coverage. As a service to our patients with approved coverage, do not have to cash out of pocket before being reimbursed for treatment by their insurance companies. No, not yet. There is a bill currently in congress that would create Medicare coverage for Acupuncture and if you would like to see this bill passed, please call your congressman and ask for their support of the Federal Acupuncture Coverage Act. BEWARE of any Acupuncturist or medical doctors that say they will bill Medicare for Acupuncture services. This is insurance fraud and a serious crime. Seniors and others on Medicare who have questions about the cost of treatment at our Center should call the office at (973)780-1888 for more information. How can I verify that an Acupuncturist practicioner knows what they are doing? Practitioners of Acupuncture and Oriental Medicine in the State of New Jersey must be state licensed health care providers. In some states, such as California and Florida, they are licensed as primary care providers. All practitioners of Acupuncture and Oriental Medicine are board certified by the National Certification Commission for Acupuncture and Oriental Medicine (NCCAOM). Please visit NCCAOM.org for additional information. What if I have other questions concerning my condition? For further information, please feel free to call us at (973)780-1888 or send us an email. The office is open Monday to Saturday (morning) by appointment. Please realize that in many cases, we will not be able to answer very specific questions (such as how many treatments will be necessary or where will the needles go) until we see you in person and evaluate your case. We look forward to becoming part of your Health Care team!